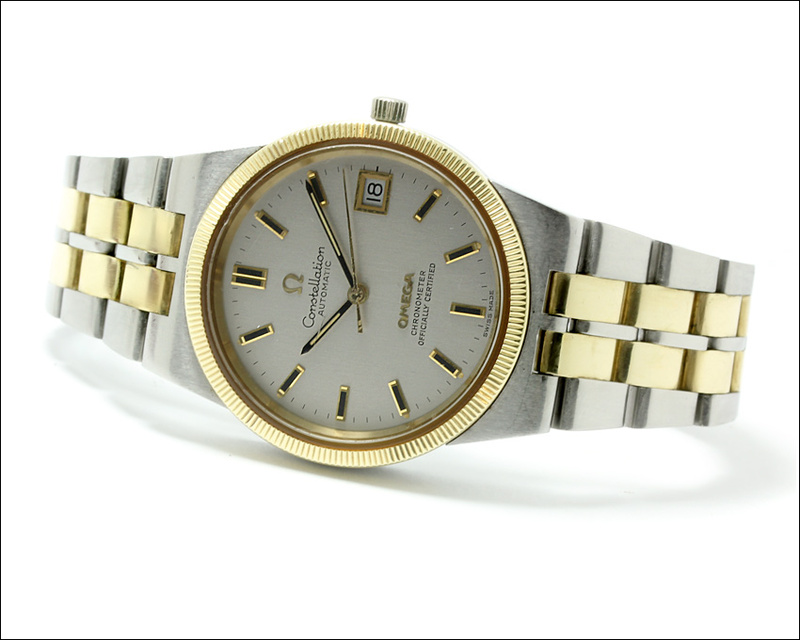 The 168.0055 (watch head), also known as the 368.0850, is one of the less common calibre 1011 integrated bracelet models to be produced in the earlier nineteen-seventies. While they're not rare by anyone's definition, they're also not plentiful, and make an excellent entry-level admission into the world of collecting chronometer grade Omegas. Powered by the calibre 1011 – see here for a review of this family of movements – the 168.0055 came in a range of dial colours and styles, including maroon and blue. 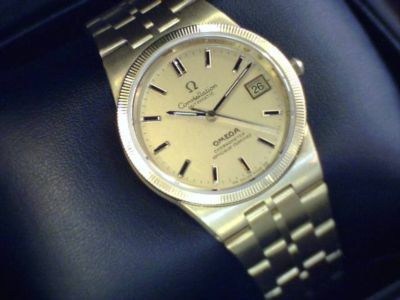 Both plain and ‘knurled’ bezels were available, depending on the metal content of the watch. 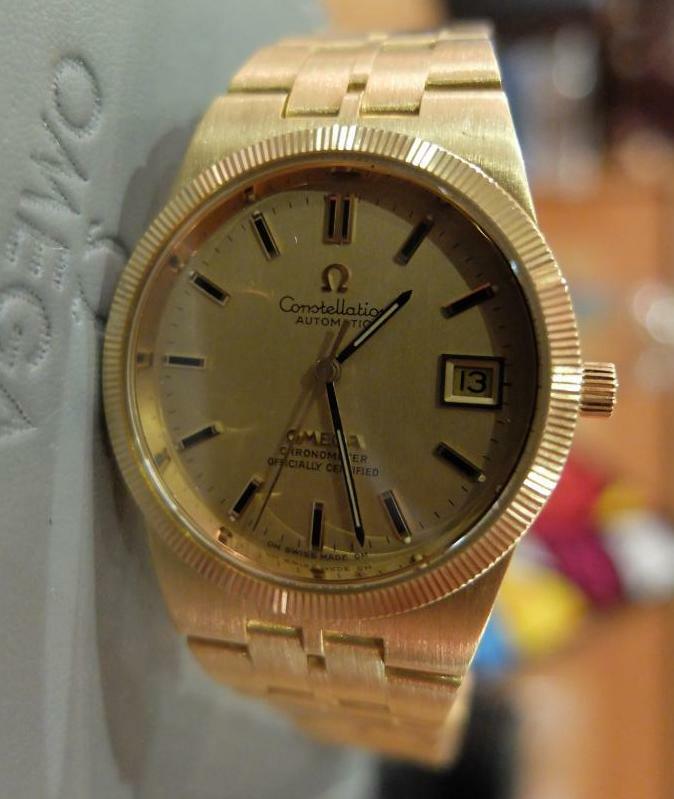 The model above has a 14k solid gold knurled bezel to match the 14k gold inserts in the bracelet. The 168.055 case has a more classic design story than the heavier integrated bracelet day-date model 368.0851 and its predecessor, 368.0845. With a case size at a little over 35mm, it is a sibling design to the 168.0061, another less common variation powered by calibre 1011. Dial furniture is consistent with other models of the period, featuring gold hour markers framing quite thick onyx inserts on some models and pointed stick hands. The watch is less ‘dated’ than some styles of the nineteen-seventies, the round knurled bezel adding a dressier feel. 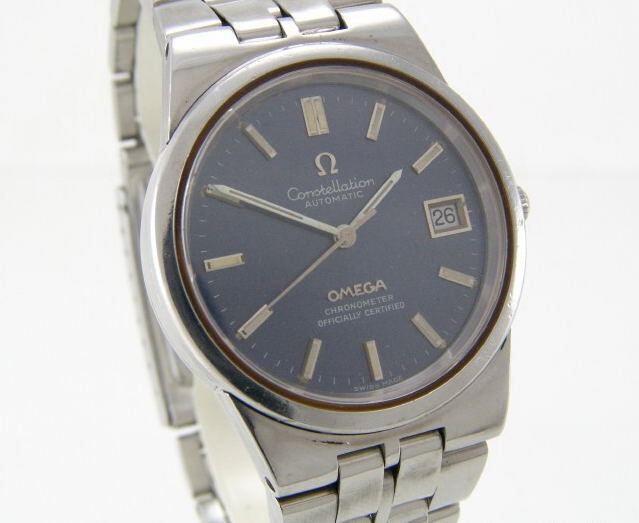 A jewellery version of this case style was released in a limited quantity by Omega in 1980 under the model number 468.0802. Featuring a solid gold dial, the hour markers and bezel were set with a total of 80 diamonds, a fitting accessory for the Gordon Ghekko wannabees of the heady nineteen-eighties. Values fluctuate with metal content and dial colour, and I have seen them fetch at auction anything from USD 350.00 for a stainless model with plain bezel to much more for the two-tone examples. A good comparative rule of thumb is to align values with what a good 368.0851 would fetch. If you're looking for a less common and dressier version of the chronometer grade calibre 1011 collection, then this model is well worth your consideration. Hi there. I'm from the Philippines and I got this Omega Constellation from my dad. He said his dad gave it to him. It's pretty old but the style looks very nice. The problem is its already rusty and pretty much needs restoration. When I asked for restoration services it costs a lot of money. Anyway, totally unrelated question to what I just said. 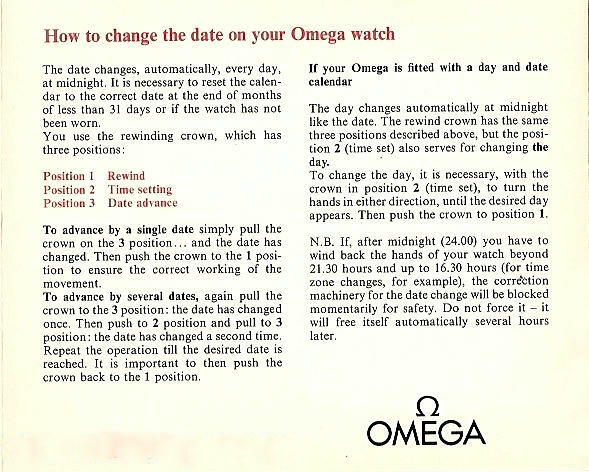 I wanna know what model of Omega Constellation that I have just so I could read about it (or info from you would be great since I'm assuming that you know a lot about Omega). Anyway, if you're willing to help then you could email me (I'm not demanding, I just don't know where to find your email address) at karlnikkotan@yahoo.com. Help will be much appreciated. Thanks! Just go to the rh column where my profile is, click on it and then click on the email tab. Happy to look at your pics. I got a vintage Omega Geneve cal.1012 Maroon (webbed tv dial). If I'm correct the 1011 is the chronometer and the 1012 isn't...no more differences true? Anyway my 1012 Geneve will not wind on any of the 4 programs on my watchwinder. Any idea why a 1012 movement will not wind on a winder? Correct. No differences except the chronometer grade movement went through more rigid selection of parts, but they are the same in design. Hmm your issue with the Geneve is fascinating. The 101X series is known for needing to be on the wrists of non sedentary and active people, and I assume that the winder just doesn't have the level of vigour needed. Thank you again Desmond, I really appreciate you sharing all the knowledge. Setting the 1012 is easy, so no issues there..I love my Geneve...it is the first real watch I bought myself when was 18 living in Caracas at the time. The 751 is 18.800 beats if I'm correct (so not a real high beater as the 1012 which I took of the winder now!). Would the 751 be ok to leave on the winder?...I wear the watch about twice a week, just too little to keep it going by itself. Would you recommend resetting the 751 once a week or leave it on the winder? Thanks again! Same advice withe the 751 Guido as the 101X calibres. My view is that vintage pieces shouldnt be left on a winder for the reasons I gave above. Any idea on replacement value. Global internet value would be around 1000.00 dollars max, although I have seen one or two cheeky sellers ask for more. Insurance replacement value, would be around four times that because the calculation is made on what it would cost to replace the watch with something similar, but new, today. I have almost the same as the first picture .. I have made complete service at Omega service center and they made it just like new, but the band has broken and I don't know where to repair it as they requested a huge amount of money to repair it at Omega.. anyone can advise ?? You don;t mention exactly how the bracelet is broken, but it depends on the metal content of the bracelet damage. For example, if the gold links are broken, you could take the watch to a manufacturing jeweller or goldsmith and ask them to repair the damage. If the stainless steel part/s is/are broken, then one option would be to scour the internet and ebay etc., and buy a replacement bracelet for parts. The Otto Frei or Jules Borel companies in the US may also have replacement parts, after which an ordinary watchmaker should be able to replace for you.